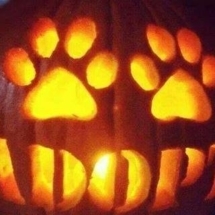 Listed below are businesses that are Kuşadası Paws & Claws Partners – they have earned our respect through their support of our cause, not only through their generous donations, but also in ethos – attitude and spirit. Let us now support Our Partners with our custom! Run your cursor over the images to learn more about these very special people . . . click the image to reach their websites . . . and let us know if you can recommend others that should be included. Ladies Beach Hotel Restaurant, voted the No.1 restaurant on Trip Advisor. 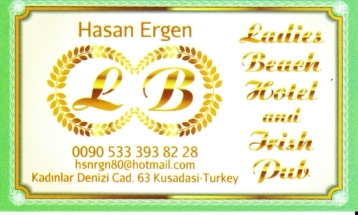 Open all year for Turkish & European cuisine, quality fresh food and friendly service Why not join us every 2nd Thursday at Ladies Beach Hotel for our darts matches, always a fun social evening. A traditional turkey and ham Christmas dinner will be served this year and a week later we are proud to host the annual Paws & Claws New Year&#039;s Day swim. 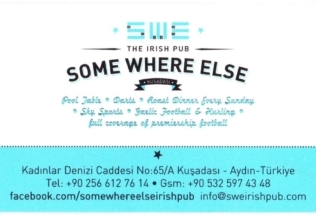 Somewhere Else beach-side restaurant offers quality, fresh, value-for-money home-made food, and uses organic, locally-sourced products - all in all, a special dining experience! 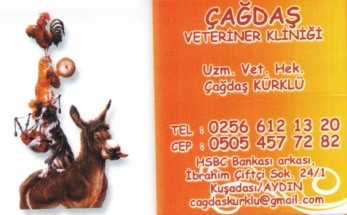 Çağdaş Vet works closely with Paws and Claws. Çağdaş and Mine always make themselves available to Paws and Claws in the care of street animals. OUR BUSINESS – provides a one-stop shop for all property related matters. Our business is built on strong principles and we have a shared vision to be the best in our profession both in terms of service and results. Drop in any time to have a chat and a cuppa with Michelle & Yilmaz, to discuss your property needs. What is the role of the Advice Centre? 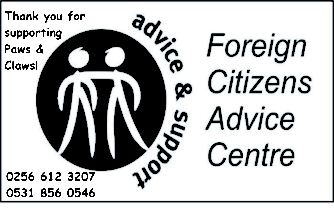 Established in 2005 and the only one of its kind in the country, the Foreign Citizens Advice Centre has been set up to assist qualifying foreign nationals with a comprehensive range of free advice and support. We can simply point you in the right direction or if you prefer, guide you every step of the way. 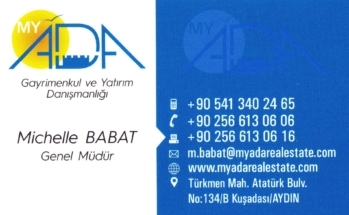 Registered in Turkey as a charitable association. 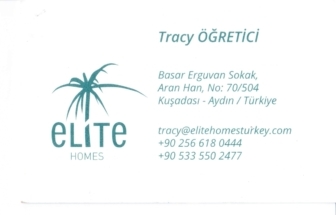 Elite Homes have been helping foreign citizens acquire or sell their properties for over 12 years - and have deservedly earned an excellent reputation for professionalism. 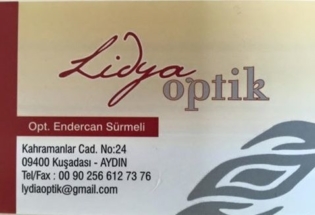 Endercan, the very kind owner of Lidya Optik participated in our swim fundraising event, sponsored other swimmers, has donated 15 kg bags of dog food for the street animals, and has sponsored a page on the 2017 Paws & Claws calendar. He also has a little rescue dog in his shop, named Çamur. Along with a very kind heart, he has the nicest collection of frames for prescription glasses and sunglasses. He is a great supporter of our cause, in return, let’s support his business while looking great in his glasses. 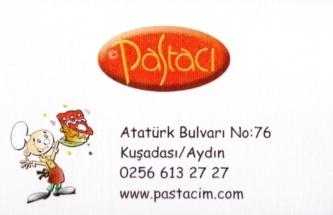 Pastacı, with its sea and sun-set view terrace in the marina district of Kuşadası has been serving delicious cakes, desserts, a great variety of pastry and chocolate delights since 2004. We’d like to help you celebrate your special days with our products. 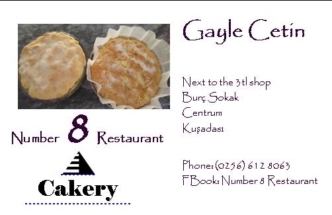 The best home-made cake shop in town - seasonal cakes baked daily with love - we also have a thrift shop and alternative therapy treatment room - contact Gayle to find out more - Make a Date with Number Eight! 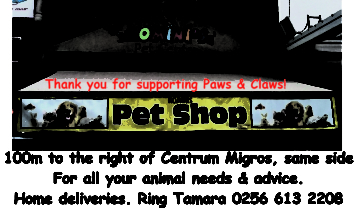 Hominis Pet Centre - owned by Tamara Keskin, not only a very kind woman, but also a great supporter of the street animals in many ways, along with taking in the sick and the needy. She is also a much valued member of our group. Thank you Tamara for everything you do! 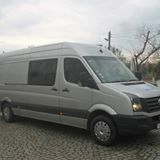 Paws Bulgaria - provide an unsurpassed service transporting pets around the world in the best possible conditions. Used regularly by our members. Delicious food, attentive service, great location, reasonable prices - what more can you ask for? The best hamam experience ever! And open throughout the year. Ring Nuri to arrange free transport.